It’s a school, but instead of English class today, the students helped serve food. The Connecticut Experiential Learning Center (CELC) went to the Branford Community Dining Room, a mostly volunteer-based organization, to feed anybody who showed up any time from 12:00-1:00pm. Two groups of five CELC students have shown up on two consecutive Thursdays to serve food. The Community Dining Room serves lunch 365 days a year, 366 on a leap year, and provides an exciting social experience to anyone interested. Community service is important to the growth of students, helping to shape them into caring community members, which is an important part of CELC’s curriculum. CELC isn’t your average middle school. It is run by two teachers, Melinda Alcosser and Maria Mortali, and consists of ten students this year. CELC travels in a white van that can hold up to thirteen students, two teachers, and the dog. At CELC, there is a blend of traditional school classes and more hands-on learning. Learn more about CELC at ctexperiential.org. Thursday, January 10th, five CELC students traveled to the Branford Community Dining Room to serve lunch. Once they arrived, the students washed their hands, put on gloves, and got started. They started by bringing napkins with silverware to tables, then waited for people to arrive. Once people started to arrive, students and other volunteers served the meals to diners. Each meal consisted of frittata, a scoop of coleslaw, and baked potatoes, with a slice of carrot cake served afterwards for dessert. Once someone had finished the first course, a CELC student or another volunteer swept in and took the plate to the sink, then returned with a dessert. Although it is hard work, community service is gratifying. 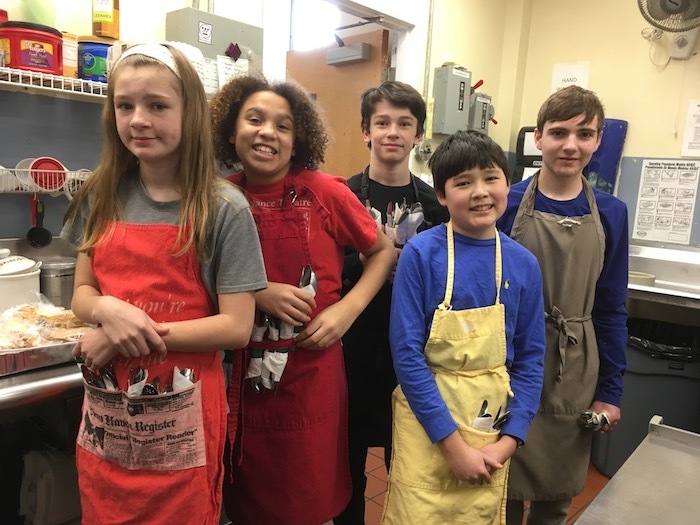 You may want to consider volunteering at the Community Dining Room, if you are over the age of fourteen or otherwise accompanied by an adult. As you may know, volunteer-based organizations are always welcoming new volunteers. It is a life experience worth having.